Dublin is on the right...everyone said he had the looks, but my mom said I had the brains! Hi! 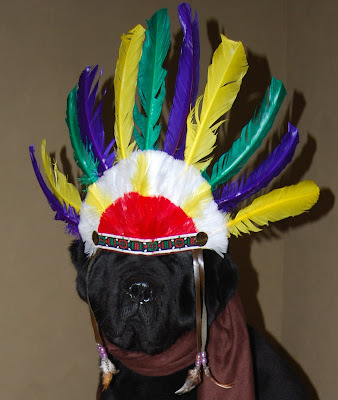 I'm a Black Lab / Newf mix named Randi Sue, but you can call me Randi...I'm 9 years old & my burpday is 12-30-1999. I've lost 35 pounds over the last two & a half years & have kept it off! I now weigh in at a very sleek 85 pounds. My littermate brother, Dublin, passed over to Rainbow Bridge on March 29, 2007 & I'm still a bit lonely - so visit me when you can & keep me company! WOOF! Secret Santa 09 - We got presents! Make a New Friend! Click Here! Butchy & Snickers - The W.F.T. Daisy the Curly Cat - MEOW! Our Sweet Randi left us at the beginning of October. I've tried various times to write this post & couldn't. But today is her birthday and I know she would want all of you to know where to send her birthday wishes to. Look to the sky & wish on a star tonight. She is up there - running and playing at Rainbow Bridge with her brother Dublin, Wally, Mango and so many other wonderful friends she met through this blog. Randi was our heart & soul. She was the best little girl you could ever hope for. She was clever, intelligent, sensitive and patient. She was an old soul and you could see in her eyes the depth of her understanding. We are grateful that we were blessed with her presence in our lives for almost 13 years. We will miss her forever. Happy Birthday Baby Girl. Our hearts ache from your absence. We will love you forever. HAPPY 11th BURPDAY TO ME! HAPPY 11th BURPDAY DEAR ME, RANDI!!! Notice the 11 in candles...on my CHEESEBURGER CAKE. Uh, Randi? Why do you keep telling me to smile? Ok, Quincy - Don't smile then...Just hang your head...(**SNICKER**) in shame...Bwhahahahaha!!! But Randi, I think Santa's gonna bring me lots of goodies cuz I've been a very good boy this year! Oh, geez...Does my little brother have a lot to learn or what? HAPPY THANKSGIVING EVERYBODY! & You know what I'm thankful for? I'm thankful that my secretary is finally posting after a half year vacation! I'm also thankful that I'm even cuter now than I was over 6 months ago! 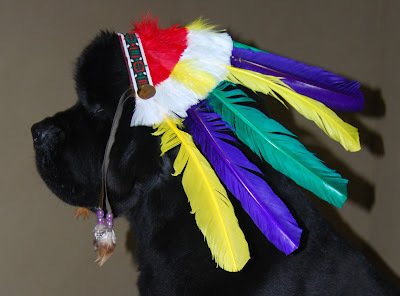 I'm also thankful that my little brother Quincy's big fat head can hold up such a gargantuan headdress, cuz that means that I don't have to wear it! I'm pretty sure he's just staring at the wall - not much up in that big empty noggin of his anyway... I'm gonna get a head start on the turkey & fixings...Let Quincy keep staring at the wall while I get a head start on the Thanksgiving nomables! On this Thanksgiving Holiday Week, I'm thankful for all my blogging friends! There will be tiaras - like MINE! & we sincerely hope the Queen's corgis have full run of the reception - lots of drunk humans equal lots of food on the floor! YUM! Happy Easter Everybody! Quincy & I have been forced once again to hold a mandatory PETA meeting (Pets Enjoy Theatrical Accessories). Its a good thing we only meet on holidays...but its a bad thing cuz thats the only time we get to blog! ***IMPORTANT ANNOUNCEMENT***: I HAVE FOUND MY EASTER BASKET! And this big bunny has not! Nom Nom Nom! MY CANDY BUNNY! But I don't care! Cuz this is the spot where I found MY Easter Basket!!! You can take a photo with my basket...but don't eat anything! Have a wonderful Easter everybody! Hey! I thought shamrocks are supposed to be tiny? Quincy makes me look like a teeny-tiny little leprechaun! Have a great St. Paddy's everyone!